As many of you are aware, in April of 2014 Cornell Dubilier (CDE) issued a discontinuance notice for a number of their axial leaded aluminum electrolytic capacitor lines. The notice included last buys until August 31, 2014. Barker Microfarads (BMI) is also a manufacturer of aluminum electrolytic capacitors and can offer equivalent axial leaded products that would replace many of these discontinued CDE parts. Raw materials are in place to quote and supply these parts at current lead times and we urge you to forward these type inquires to us accompanied by any relevant drawings or part specifications. This announcement is intended to provide 30 day notice that effective on June 23rd, 2014 that Illinois Capacitor will be having a price increase. If you need to order any products please do so prior to the date listed above or you will be subject to this increase in pricing. 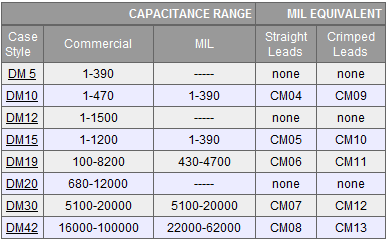 Capacitance ranges from 50 pf to 5000 μF are available. Standard tolerance is ±10%, however, tolerances to ±.25% are available..
Voltage Ranges from 30 to 250 KVDC. AC voltages up to 50 KV and100 KHz are available. Carrying 50 Million Dipped Tantalum Capacitors, R&J Components boasts among the largest stock in the world! Dipped Tantalum Capacitors are electrolytic capacitors which use tantalum metal for the anode. They are polarized capacitors with superior frequency and stability characteristics. These are high capacitance/small volume capacitors, and among the most durable and resilient capacitors in adverse external environmental conditions. Popular in power supplies, medical electronics, computer boards, military hardware and audio products, Dipped Tantalum Capacitors are one of the most fail safe parts in any build. In our over 100,000 Square feet of Electronic Component inventory, there are 50 Million reasons to use R&J Components for your Dipped Tantalum Capacitors! Capacitors manufactured by Capacitors Industries include brands such as; Motor Capacitors, Inc., Chicago Condenser Corporation, and SEI Capacitors, Inc. These capacitors are used in a wide variety of applications. MINIBOX style capacitors are an excellent choice for general purpose applications such as bypass,decoupling,smooth & some timing,energy storage/discharge & arc suppresion applications. Specialized MINIBOX capacitors are designed for Radio Interference Suppression (Class X2, Class Y) & also for high current applications. Designed for PC Board insertion, they offer volumetric efficiency in rectangular space saving body types with PCM ranging from 5.00 mm to 30 mm. MINIBOX capacitors often replace dipped Radial Film capacitors in PC board applications. MINIBOX capacitors are offered in bulk packaging as well as tape & reel for automatic insertion machinery. R&J Components is a Franchised/Authorized stocking distributor of MINIBOX type capacitors. We stock & sell product by such great MINIBOX Capacitor Mfgr's as: ILLINOIS CAPACITOR & MERITEK. Our technical ability is second to none, We offer expert cross referencing & samples are never an issue at R&J Components! Computer Grade (screw top) – HVAC, telecommunications, power systems. Contact us with your requirements, and we will supply you with a quote from Genteq with a great price and any technical support you need. Snap Mount- high capacitance and voltage in a small form factor. Switching power supplies and UPS. We can offer Nichicon and Illinois Capacitor direct form the factory. Nichicon, Illinois capacitor can deliver high quality at a good price. If you don’t see what you need please contact us. And we can help find an equal or upgrade to meet you application requirements. With over 65yrs of experience and over 420,000 line items R&J is the right choice for all you component needs. HT Series Ceramic Capacitors are small, RF-capable, Class1 parts featuring high Voltage, Current and Power ratings. They exhibit a low dissipation factor and minimum self-inductance. These extremely rugged capacitors are carefully designed to live in the demanding world of broadcast and high-voltage industrial application. Their structure is both simple and robust, assuring a long trouble free life. HT Series parts feature a nonconductive, humidity-resistant, coating and a long flashover path. They are build upon a choice of six Class I dielectrics, providing a broad range of capacitance and temperature coefficients. Typical applications include transmitters, antennas, induction heating, X-ray, diathermy and welding. R&J Components is an authorized distributor for Genteq capacitors. (formerly GE capaciotrs) They offer an extensive line of capacitors such as: Oil-Filled, Motor Run, HID Lighting, General Purpose, Dry: Motor Run, Motor Start, HID Lighting, Electrolytic: Screw Terminal, and Snap-In. These capacitors are used in a wide variety of industrial applications. Refrigeration, HVAC, Hermetic, Agriculture, Food and Beverage, Lighting (high intensity), Manufacturing, Medical, Oil and Gas, Pool and Spa, Power Systems, Transportation, Uninterruptable Power Supplies, Power, Factor Correction, Power Conditioning, Welding Machines, Appliances, Air Compressors, Elevators / Escalators, Wind, Energy, ATM Machines, ECM Motors ,Drives (Elevators, Escalators, Wind Energy, UPS Systems, and Power Conditioning. We have the experience to offer equals or crosses to the value you are looking for, that may not be available, or has a long lead time. The ASC Capacitor parts are numbered by Type Number, Case/Lead Style, Capacitance Value, Capacitance Tolerance, and Voltage. See the example below to create a part number. 2: Indicates the dielectric material. 3: Indicates the "series type." 4: Additional information, if needed, regarding the configuration of the component. Some examples are below. 5: Capacitance in MFD, spelled out. The advantages and disadvantages of the various dielectrics are detailed above. Use the dropdown menus below to identify which part numbers signify which dielectrics. The cap code is a three digit number that identifies the capacitance of a capacitor. The first two digits are significant, and the third digit is the number of trailing zeroes. For example, 202 would be 2000 pF. An R indicates a decimal point, so 1R6 = 1.6 pF. Various modifications that can for example, change the number or positioning of the leads. More information can be provided in the Sprague-Goodman catalogs.